Paper roses are a fun craft to make and require minimal supplies. They also make a great gift to give to someone special! You can make paper roses using the rolling method which is both quick and easy. Alternatively, you can make paper roses using the folding method which takes a bit longer and requires more practice. Both methods have a beautiful and impressive end result! Get 1 sheet of A4 construction paper. A4 is the standard size of paper and measures . Choose your preferred color of construction paper to make the paper roses with. The number of paper roses that you can make per sheet of paper depends on the size of each rose. In this example, 1 sheet of A4 paper is large enough to make 2 paper roses. You don’t have to use construction paper. Cardstock, scrapbooking paper, music sheets, and old book pages can all also be used. 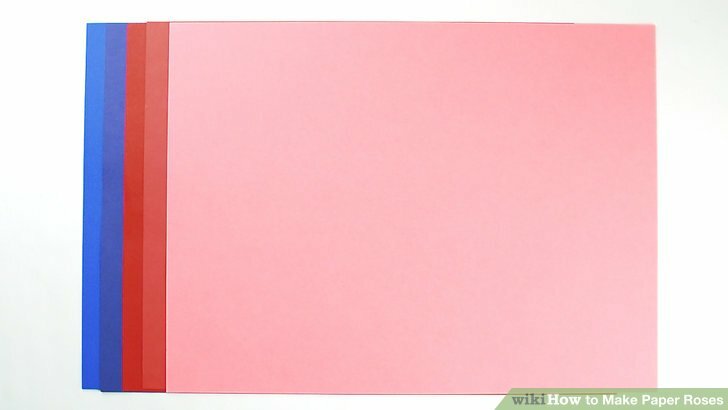 Popular paper colors for roses are pink, red, white, yellow, and orange. Cut 1 circle out of the construction paper. Use a compass or trace something such as a round plastic lid onto the paper. Use a pencil so that you can easily change any mistakes. Once you have drawn the circle, use scissors to cut it out of the construction paper. For each rose that you want to make, cut out 1 circle. A circle that is in diameter is just an approximate size. Use smaller or larger circles to adjust the size of your paper rose. If you are wanting to make smaller roses, trace around a circular coffee mug. Draw a spiral within the circle. Use a pencil to draw a spiral that begins along the edge of the circle and ends in the center. Start the spiral narrow and make it become wider towards the center. The center of the spiral needs to be approximately thick. Alternatively, you don’t need to draw a spiral on the circle if you feel confident in cutting one without having a guideline. You can draw a spiral with slightly wavy edges rather than straight if you prefer. Cut out the spiral. Follow the guideline of the spiral that you drew on the circle. You can erase any pencil lines after you have cut the spiral out if you like. Roll the paper tightly in the spiral shape. Begin at the narrow end of the spiral and roll the paper towards the center. At the beginning of the spiral where it is very narrow, you may need to fold the paper in rather than roll it. This is the center of the rose. Roll the paper tightly so that it doesn’t easily unravel. Fold the spiral center to make a flat base for the rolled paper. Once you reach the center of the spiral, it will be difficult to roll it any further. Simply press the center of the spiral firmly over the bottom of the base of the rolled paper. The rolled paper will rest on the flat surface. The flat base is the bottom of the rose. Let the rose uncoil to your preferred size. Slowly release the pressure that you are using to hold the rose together. This makes the rose gradually uncoil and become larger. Stop letting the rose unravel when it is the size that you want. Glue the base to the bottom of the rose. Once the rose is your desired size, place a dollop of hot glue in the center of the flat base. Then push the spiral rose against the base to hold it together. You may have to hold the rose in place for around 1 minute while you are waiting for the hot glue to dry. Once the glue is dry, it the rose is complete and ready to use. Alternatively, you can use craft glue rather than hot glue, however, this will take a much longer time to dry. Cut out 4 squares from construction paper. Pick your preferred color of construction paper. Use a ruler and a pencil to mark out the squares. Then cut out the 4 squares using scissors. You need 4 squares to make 1 paper rose. Make more squares if you want to create more paper roses at the same time. Cardstock is the best to use for this type of paper rose because it is strong enough to hold all of the layers and glue together. Fold each square diagonally. Bring 1 corner to the opposite, diagonal corner of the square. Press along the fold to create a triangle shape. Repeat this for all 4 squares. Fold 1 corner of each triangle base over the opposite side. Face each triangle base toward you. Bring 1 corner of each triangle base up to the middle of the opposite edge. Approximately of the corner is beyond the edge when it is folded. This looks like 3 smaller triangles. Bring the other base corner over the opposite side for each piece of paper. Fold the second corner of the base over the first folded corner that runs through the center of the triangle and up to the opposite side. The second corner will also reach approximately over the edge. Repeat this for each of the 4 pieces of paper. Draw the shape of a petal around the sole point on each piece of paper. The paper has 4 points, with 3 grouped together on one side and 1 on the opposite side. Use a pencil to draw the rounded edge shape of a petal from one side of the triangle to the other. Do this on all 4 sheets of folded paper. Cut along the petal outline to cut out a flower shape from each piece of paper. Use scissors to cut around the petal guidelines that you drew on each piece of paper. Separate the group of 3 points from the 1 sole point. Use an eraser to remove any pencil marks if you prefer. Cut the point off each group of folded petals. Use scissors to cut straight across the point, removing approximately . This creates a shape with 1 straight edge and 1 rounded edge. Discard the rest of the paper. Curl each petal edge around a toothpick. 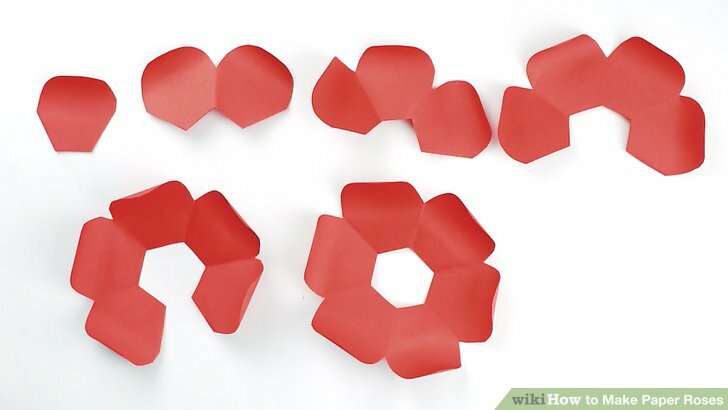 Unfold the 4 sheets of paper to reveal flower-like shapes with a hole in each center. Wrap the top of each petal around a toothpick to give it a slightly curly shape. Cut out petals from each rose pattern. Simply cut along the fold to cut out an individual petal and to create a gap in the ring of joined petals. Leave the first rose pattern as it is. Remove 1 petal from the second pattern, 2 petals from the third pattern, and 3 petals from the fourth pattern. This means that the first pattern has all 6 petals, the second has 5 petals remaining, the third has 4 petals remaining, and the fourth has only 3 petals remaining. The petals that you have cut out that you need to keep are the group of 2 petals and the 1 single petal. The rest can be discarded. Glue the ends of each rose pattern together to join the petals into a ring. Use a glue stick to attach the ends of each rose pattern together to create a ring once again. Each ring gets subsequently smaller. When you reach the 1 single petal, simply glue 1 side to the other to create a cone-like shape. Cut out a circular piece of paper and glue it to the base of the 6-petal rose. Use the same color of construction paper. Make such that the ring in the center of the 6 petal rose is completely covered. This is the base of the rose. The size of the circular piece of paper depends on the amount of paper that you cut out to create the petal shapes. Approximately will work in most cases. Measure the size of the ring first if you are unsure. To attach the layers, place the glue around the base of the rose. Then press the layer of petals onto the base to help it stick together. Repeat this process for each layer of petals. Use either a hot glue gun or craft glue to attach each layer. Let the rose dry once it is complete. Paper roses make great decorations for wreaths or for adding decorations to other crafts. Making paper roses can take a while to get right. Keep practicing and it will become easier each time.